Mitchell Flint, the great American warrior and ace pilot died as bravely as he lived, at his Los Angeles home in the early hours of Saturday, September 16, 2017 at age 94, having served his country, his heritage and his fellowman. Few, if any, soldiers can claim to have served in World War II, the Korean War, the Cold War and as a volunteer fighter and bomber pilot in the 1948 War of Independence for Israel. Flint is the only pilot in history to fly in wartime combat what are arguably the four greatest fighter planes of the World War II era, the Corsair, the P-51 Mustang, the German ME 109 Messerschmidt and the British Supermarine Spitfire. Born in Kansas City, Missouri June 27, 1923, Flint volunteered at age 18 to serve the United States Navy in World War II and soon earned his Naval Aviator Wings of Gold in Corpus Christie. Fighting in the Pacific Theatre, he flew dive-bombing missions off of the USS WASP in the F6F Hellcat and the F4U Corsair. Flint would prove his mastery of this plane, chasing and bringing down the very fast kamikaze C6N Saiun Myrt. His conquests earned him three Air Medals and eight Navy Unit Commendations. Following the war, Flint, who would later become a practicing attorney in Hollywood, was headed to the 1948 Olympic Games to celebrate his graduation from UC-Berkeley in June of 1948. Hearing the call of a distant conflict that threatened the lives of the holocaust survivors that had migrated to Israel in hopes of a better life, Flint, a Jew, decided to volunteer his pilot services for the sake of his ancestral homeland. To save his mother from any anguish and not wanting the US State Department to discover his legally forbidden choice, Flint, through a ruse of postcards that would be sent from London, made it appear he was gone to the London Olympics. Flint went on to Czechoslovakia, and for much of July he trained on the Avia S-199, which he and most of the Pilots referred to as a flying coffin. By August, Flint would start to fly for the fledgling State of Israel, now threatened by the Arab forces. Flint, on August 15 narrowly escaped being under fire from an Egyptian AAA, but emerged unscathed. On August 17, Flint took up the D-117 for an exhibition staged for Israel’s Prime Minister Ben-Gurion. On August 20, in the unforgiving S-199, Flint had to make an emergency wheels-up landing when his gear would not deploy and the following day he would survive a crack up on bringing his plane to the ground. Both incidents were deftly handled and the planes were repaired and put back into service. Flint was asked and agreed to join 35-Flight, primarily a dive-bombing unit. He accepted and was named executive officer. This was only the beginning of Flint’s heroic flights, as he successfully flew in over 50 missions for Israel’s miraculous subjugation of the combined Arab forces, including leading one of the fledgling state’s most pivotal battles. Perhaps his proudest moment was when in 1949 he flew in Israel’s First Independence Day Parade and for the first time, Israel’s entire fighter squadron of 12 fighter planes got in the sky at the same time, led by future Israeli President Ezer Weizman. Mitchell pulled up the rear and was the last plane of the 12 to fly over that day. Prophetically, Mitchell was the last living pilot of that group of flyers. 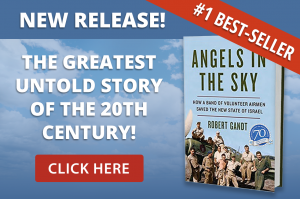 These exploits and the efforts of Mitchell Flint and his colleagues in the 1948 War of Independence have now been memorialized in the book, ANGELS IN THE SKY, written by best-selling author Bob Gandt and released from Norton Publishing. Flint is survived by his wife, Joyce, and his sons Michael and Guy.